A new exhibition explores 200 years of American design through the example of the chair. 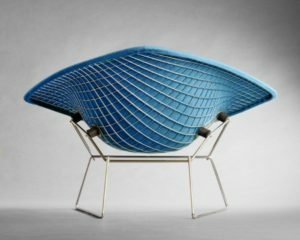 Designed by Harry Bertoia, Manufactured by Knoll Associates, New York City, NY, Large Diamond Lounge Chair, circa 1952. Designed and Manufactured by Vivian Beer, Penland, NC, Current, 2004. In the realm of decorative arts, the humble chair is unique in its capacity for both functional utilitarianism and powerful symbolism. A chair can be meant for something as straightforward as dining or for conveying one’s status to a throng of admirers. It can be a piece of art or a piece of furniture. It can be simple and timeless, like a ladderback rocker, or practically unrecognizable. It’s this wide range of uses, styles, and materials that is on display in the exhibition “The Art of Seating: 200 Years of American Design” at The Society of the Four Arts in Palm Beach, Fla. Spanning the early 19th century to today, the show includes important pieces by major designers such as Charles and Ray Eames, Frank Gehry, Isamu Noguchi, and Frank Lloyd Wright, not to mention historically significant pieces like the 1857 House of Representatives Chamber Arm Chair. This touring show was originated by the Museum of Contemporary Art Jacksonville, and features pieces from the private American Chair Collection, as well as the Thomas H. and Diane DeMell Jacobsen Ph.D. Foundation. And while the chairs themselves are, of course, the focus of the show, “The Art of Seating” also aims to give viewers a comprehensive look at the design process through patent drawings, artist renderings, and other documentation. 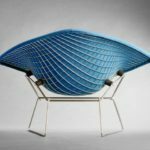 “This project presents chairs as not only elegant art forms but also relatable everyday objects that speak to aesthetic trends, the emergence of new technologies, and concepts of ergonomics,” says Rebecca Dunham, curator and Head of Fine Arts at The Society of the Four Arts. There are several standout pieces among the 43 chairs on display, from a wide range of time periods. The circa 1894–96 “McKinley” Arm Chair, a style named for U.S. President William McKinley, is one of the most historically significant pieces in the exhibition. 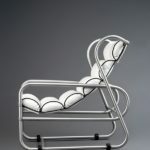 The chair was designed by David Wolcott Kendall and manufactured by the Phoenix Furniture Company. 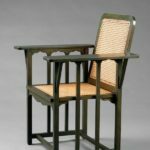 Crafted of cane and oak, and with minimal decoration—only subtle Moorish arches on the arms—the “McKinley” chair is often cited as an early example of the American Mission style. After one was presented to President McKinley, and shortly thereafter named after him, other designers began copying the design. This led Kendall to patent it in 1897. Another striking chair on view is a bright, bold blue Texas Longhorn armchair crafted out of Texas Longhorn ivory, brass, glass, and silk, circa 1890. 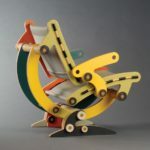 The piece was designed and manufactured in San Antonio, Tex., by designer Wenzel Friedrich. 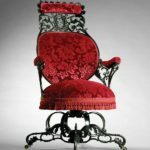 There’s also an unusual 1870 Curule Side Chair, featuring graceful curves in ebonized cherry and a yellow silk show cover. The design was created and patented by George Hunzinger. Those interested in design of the 20th century will also enjoy architect Frank Gehry’s minimalist High Stool. Crafted in 1971, the two-legged stool is made of corrugated cardboard, wood, and Masonite, and reflects the same fascination with curves, functionality, and experimentation that would come to characterize Gehry’s later architectural creations. There are many other exceptional examples of 20th-century design, specifically mid-century modern, in this exhibition—Isamu Noguchi’s Rocking Stool, from 1958, Harry Bertoia’s Large Diamond Lounge Chair and Bird Lounge Chair, both from 1952, and Erwine and Estelle Laverne’s acrylic Lily Chair, from 1957. 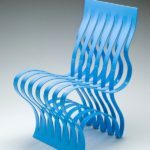 More recent selections include the 2004 wavy, electric-blue metal chair Current, by New Hampshire-based artist Vivian Beer and the almost mechanical-looking Synergistic Synthesis XVII sub b1 Chair by Berkeley, Calif., designer Kenneth Smythe.